The TOPAZ512 chip is BROADCOM company's NFC chip products, compatibility is very good, belongs to the NFC Forum Type 1 Tag, 7bytes UID, 480bytes capacity, basically can achieve all the common NFC operation. But the reading and writing device does not support reading and writing, if the number is less,can be written by NFC mobile phones. Screen printing,marking,dust-proof,waterproof,anti-shock,dozens shape can be selected. This chips can package of proximity cards, RFID wristbands, keychains and stickers labels such as.ODM and OEM products according to customer demand. cope of application:access control attendance,identification,bus,car parks,tickets,product identification,school management,community management,member management,integral,consumption system,etc. 1. electronic payment, especially the electronic payment on mobile phone. 2. information interoperability, security, the transmission, exchange business cards with NFC, attendance etc..
3. tag identification, authentication, identity identification. 4. online download applications, such as membership, coupons, multi-purpose card, etc..
5. intelligent transportation, on-street parking management, street lane and parking management, car number information in real time, motion set loss, illegal punishmentetc,etc. 1. Small and exquisite appearance,durable,not off color. 2. The products are waterproof,shockproof and corrosion resistance. 3. 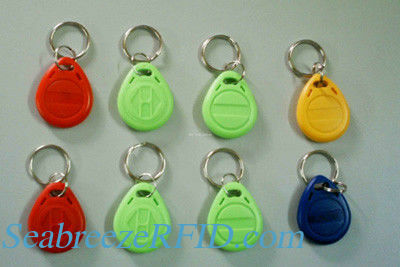 Can be hung on the key chain,easy to carry. 4. A variety of styles and colors to choose from. 5. According to customers design appearance. 6.125KHz/13.56MHz multiple chips can be on-demand encapsulation,composite packaging. 7. Can be sprayed ID number,serial number.